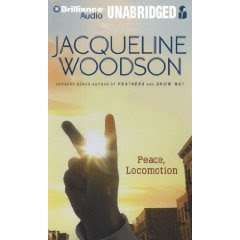 Peace, Locomotion by Jaqueline Woodson. Putnam, an imprint of Penguin Books. 2009. Brilliance Audio 2009. Reviewed from audiobook from Brilliance. Narrated by Dion Graham. Sequel to Locomotion . The Plot: Lonnie Collins Motion, "Locomotion," is in sixth grade. He lives with his foster mother, Miss Edna; is adjusting to life with a new teacher who informs him he cannot call himself an poet until he's published a book; and tries to keep his close relationship with his younger sister, Lili, who lives in a different foster home. The Good: I have never read Locomotion, the story of Lonnie as a fifth grader, who finds his voice, his confidence, his love of writing as a student to a gifted teacher at the same time that he deals with the aftermath and grief of the fire that killed his parents and orphaned himself and his sister. So, all I can say, is in this book I fell head over heels for Lonnie. Lonnie and his younger sister, Lili, live in two different foster homes. The first reason I fell in love with this story? Both foster families love and care for their foster children. Both children love their foster families -- Lili more easily, Lonnie having more difficulty acknowledging to himself that Miss Edna and her sons, Rodney and Jenkins, are now his family and that is OK. The second reason? Lonnie and Lili maintaining a close, sibling relationship even though they are in separate homes and families. Next to love is Rodney and Jenkins, Miss Edna's two grown sons. Rodney lives at home and affectionately calls Lonnie "little brother" and is an awesome big brother. Jenkins is a soldier in the war. During the course of the book, he is first missing in action and later found, injured, and returns home not quite the person he was. Jenkins' path from injured to rejoining his family is not an easy one. While there are dark things in these books -- the deaths of Lonnie and Lili's parents, the separation of the children, a thoughtless teacher, Jenkins' injuries -- there is never darkness. Love and peace, in words, actions, and thoughts, shines through. Graham's narration brings Lonnie to life; his hopes, his fears, his dreams, his every day sixth grader life balanced with his concerns and love for Lili and their future. I loved the first one, Locomotion and will have to give this one a try. Love the cover! I loved the title of this one to begin with - have wanted to read it just for that AND that it's a Woodson book. SLJ Round One, Match Six: Peace or Gifts? SLJ Round One, Match Four: Lips or Lost? It's a Plane, It's Superman, No, It's Betsy Bird!